The deep concern of the Communist Party of Greece about the two Greek soldiers who remain detained in Turkey was expressed by the Party's General Secretary Dimitris Koutsoumbas during his today speech at the KKE anti-imperialist rally in Thessaloniki. Koutsoumbas highlighted the heavy responsibilities of the Greek government for its policy of complacency, which hides the dangerous sharpening of the contradictions in the region. 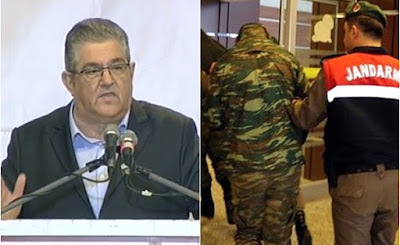 "We want to express our deep concern for the escalation and the turn of the events regarding the case of the two Greek soldiers who were arrested and remain detained in Turkey. We want to express our deep concern because, as it seems, these two soldiers become pawns in the chessboard of the contradictions of Turkish agressiveness and provocation. However, at the same time, we can't but highlight the responsibilities of the Greek government which, on this issue as well, follows the known policy that it follows in the Greek-Turkish relations. Complacency, cover up and assurances that the issue will be solved and that the soldiers will return quickly. And when reality refutes them [the government], they deposit the hopes in NATO and the EU in order to supposedly solve the problems, something that of course has never happened. If they aren't naive- and they are not- they are dangerous because they want to hide from the working class, from the people that the sharpening of the contradictions between the Greek and Turkish bourgeois class affects and is affected directly from the developments in the broader region and can consist a fundamental factor for the triggering of Greece's direct involvement in war.